In a thrilling finish to the Liffey Descent, Salmon Leap’s Gary Mawer and Barry Watkins out-sprinted the Spanish boat of Luis Amado-Perez Blanco and Miguel Llorens Lopez to win by just ten seconds in 1 hrs 48 mins 39 secs for the 17-mile course from Straffan to Islandbridge. After the heavy rain of the previous day, Palmerstown weir took many victims, among them last year’s winners Peter Egan and Jon Simmons, who capsized in the notorious double stopper while lying second. They ended up out of the medals in fourth place behind the Daniels brothers. 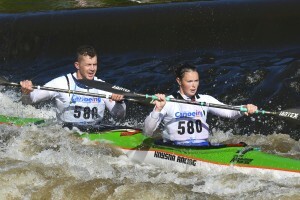 A spill at the same weir meant hopes of a course record ended for Jenny Egan and her British Olympic squad partner Jonathan Boyton. 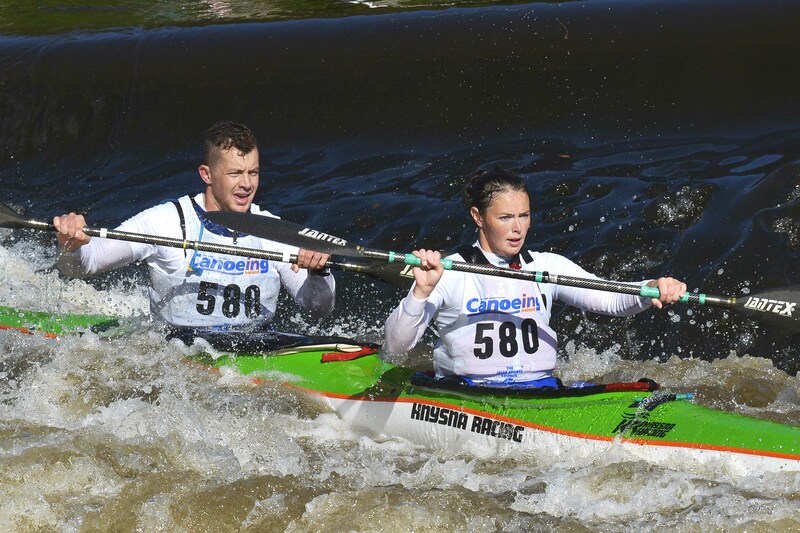 They still finished sixth overall and first mixed pair with their time of 1:58.44 – two minutes off the time Egan recorded with a different partner two years ago. Spain’s Federico Vega Suarez won men’s K1 in 1:57.17, with Salmon Leap’s Liam McCarthy over a minute behind for second. A close battle in master’s K1 saw British paddler Steve Baker edging out many times Liffey winner Malcolm Banks of Salmon Leap. A thought: in the past, the Liffey Descent, which has been one of the great Irish sporting days out since 1960 (-ish), took place early in September with the finish at Memorial Park. That meant lots of spectators, a great atmosphere – and warmer water for those who took a swim. It often coincided with the Liffey Swim, another long-established Irish sporting institution. In recent years, we have also had the Dublin City Triathlon taking place around the same time. 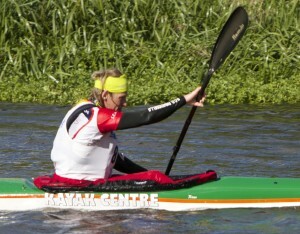 So why not have all three events on the same weekend as a “Liffey Watersport Festival”? It would mean only one “flood” (release of water from the reservoirs) and help bring the carnival atmosphere back. Maybe even add the sailors and the rowers who hold races at the mouth of the river? Senior (24 finishers) – 1 Gary Mawer/Barry Watkins (SLCC) 1:48.39, 2 Luis Amado-Perez Blanco/Miguel Llorens Lopez (Ribadesella, SPA) 1:48.49, 3 Tom Daniels/Andy Daniels (Longridge CC, ENG) 1:50.02, 4 Peter Egan/Jon Simmons (SLCC) 1:50.45, 5 Deaglain O Drisceoil/Tim Pendle (SLCC/BCU) 1:51.53, 6 Jenny Egan/Jonathan Boyton (SLCC/BCU) 1:58.44. Jun – 1 Craig Cummins/Mark Slattery (WWKC) 2:05.54, 2 William Bird/Jack Childerstone (Worcester/Wey, ENG) 2:12.27. Mixed (9)– 1 Egan/Boyton (SLCC/BCU) 1:58.44, 2 Anja Bunzel/James Smyth (Kanuverein Peitze V/WWKC) 2:06.15, 3 Alison Galloway/Piran Shelly (BCU) 2:10.26. Masters (11)- 1 Declan Halton/Liam McCarthy (SLCC) 2:04.11, 2 Carl Pilliner/Jeff Hyde (BCU) 2:21.32, 3 Tony Dillon/Brendan O’Brien (WWKC) 2:23.42. Senior (22) – 1 Federico Vega Suarez (Ribadesella, SPA) 1:57.17, 2 Sean McCarthy (SLCC) 1:58.48, 3 David Francis (BCU) 2:0037. Jun – 1 Jack O’Hagan (SLCC) 2:05.59, 2 Francisco Maya Martinez (Ribadesella, SPA) 2:17.39, 3 Brian O’Neill (SLCC) 2:18.49. Masters – 1 Steve Baker (BCU) 2:01.00, 2 Malcolm Banks (SLCC) 2:01.04, 3 Jimmy Butler (BCU) 2:04.49. K3 Fergus Cooper/Larry Mellon/Steven Forese (Contrast) 2:16.42. T2 (28) – 1 Mick Keating/Donal Keating (SLCC) 2:11.50, 2 Gerry Collins/Brian Gallagher (SLCC) 2:14.04, 3 David McDonnell/Noel O’Connell (Kilcullen) 2:15.07. Mixed: Eileen Murphy/Sean Pierce (SLCC/ICU) 2:19.33. Masters (10) Gordon Woodhead/Christo Horn (BCU) 2:15.25. Senior (11) – 1 Jamie Christie (BCU) 2:07.46, 2 Paul Forristal (Thomastown) 2:15.25, 3 Shayne Hadland (BCU) 2:25.12. Senior (107) – 1 Mark Redmond (WWKC) 2:29.02, 2 Kevin Cahill (Phoenix KC) 2:29.54, 3 Eoin Keyes (Limerick KC) 2:33.02. Junior (11) – 1 Oisin Farrell (Kilcullen CC) 2:28.52, 2 Jack Ledwith (Cavan CC) 2:34.10, 3 Sean Cahill (Phoenix KC) 2:39.25. Masters (79)– 1 Edward Broekaart (Donegla CC) 2:30.38, 2 John Mollohan ( Rockhoppers) 2:32.13, 3 Robert McKernan (Voyagers) 2:34.08. Senior (33): 1 Laura Griffin (DCU) 2:41.35, 2 Eileen Kelly (Castleknock Com College) 2:49.03, 3 Eibhlin Mulrow (WWKC) 3:06.28. Junior (2): Ciara Gurhy (Voyagers) 2:51.20. Touring single (4) Andrew Redmond (WWKC) 3:18.41. Touring Triple (20): Finbar O’Donovan/David Comerford/Cait Broderick (Thomastown) 2:46.25.